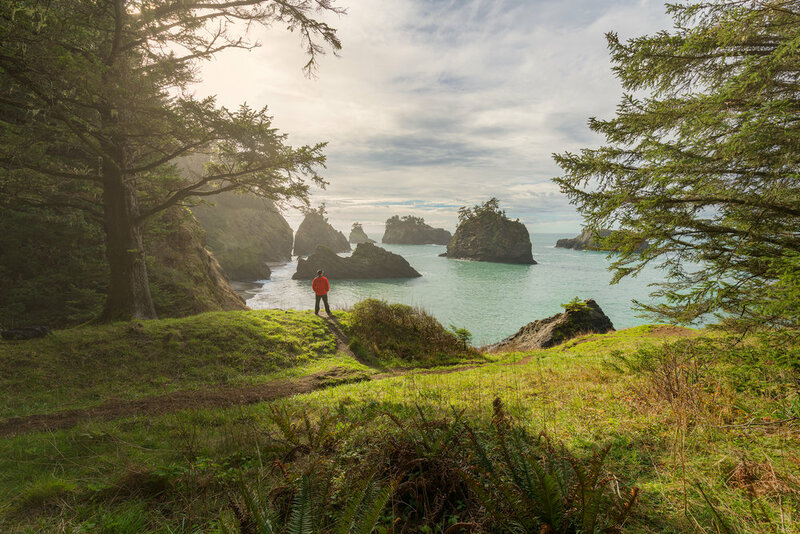 The Oregon Coast is one of the most beautiful coastlines in the world. I was lucky enough to be able to spend 6 days driving and photographing the entire coast from South to North in February. Well technically from North to South, then back North again. We flew into Portland, and drove 5.5 hours south to Brookings where we stayed our first night. Now, we expected to have a typical Oregon winter trip, full of rain and overcast clouds. However, we got up early and drove to the Oregon Coast Highway Viewpoint. There are no markings for the place, however, it is on Google maps. We parked on a small pullout, and made the short 5 minute hike to the top of the hill. What a view, and Oregon gave us a beautiful, vibrant sunrise! Once we recovered from the sunrise, we drove to one of the most beautiful stretches of coastline I've ever seen. A place called Samuel H Boardman State Scenic Corridor. Along the highway there are trails that take you to places like Natural Bridges and Secret Beach. If you're really wanting to get an amazing sunset, then the hill overlooking Secret Beach is the place to be! The first full day at Samuel H. Boardman followed by an epic sunset was just perfect. Reluctantly, we had to move on. We packed up on the morning of day 2 and drove 1.5 hours North to the charming, foggy town of Bandon. Giant Sea stacks right on the coast in the middle of town are the stars of this coastline. Tall, beaufiful and dramatic as they rise up out of the sand. 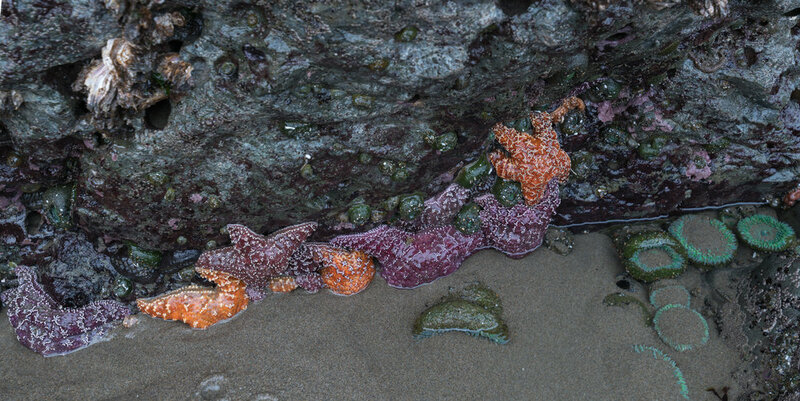 You can walk right up to them, especially at low tide and see all the starfish and anemones in the tide pools. And as luck would have it, 30 minutes prior to sunset the fog cleared, and the overcast clouds dissipated, revealing a beautiful and colorful sunset! How lucky were we!!?? 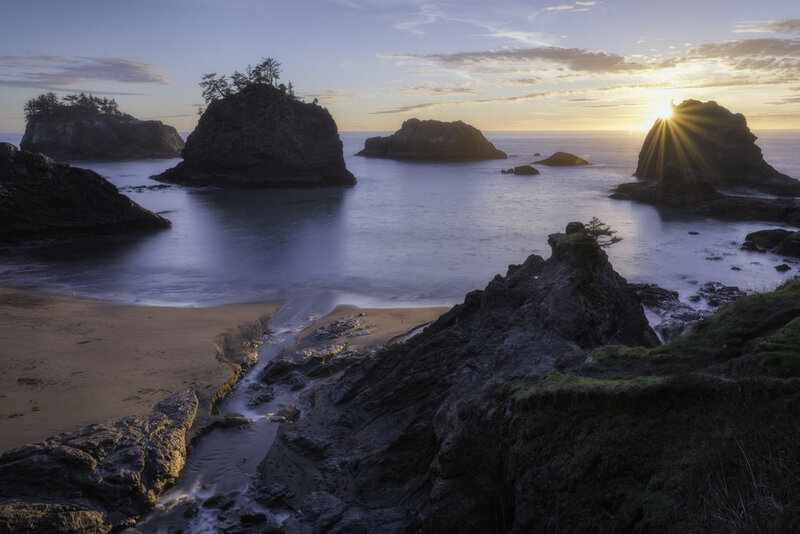 Bandon Sea Stacks at sunset. Starfish and anemones on the sea stacks in Bandon. The next morning we got up before sunrise, and drove to Reedsport, and the Dean Creek Elk viewing area to see a resident herd of Roosevelt Elk. 2 Roosevelt Bull Elk sparring out in the viewing area. We then continued 45 minutes up the coast to the giant Sea Lion Caves. I've never seen so many sea lions in one place! You have to take an elevator about 120 feet down to the cave! From there we went to the famous Thor's Well. This is a sinkhole just south of Yachats and in the Spouting Horn parking lot. At high tide, the waves come up through the sinkhole, the rushes back down creating an amazing scene! If you can time your trip with high tide and sunset, you can really photograph something special. We weren't so lucky with our timing on this trip. Just be careful of the sneaker waves! You can get soaked or even knocked over if you stand too close! 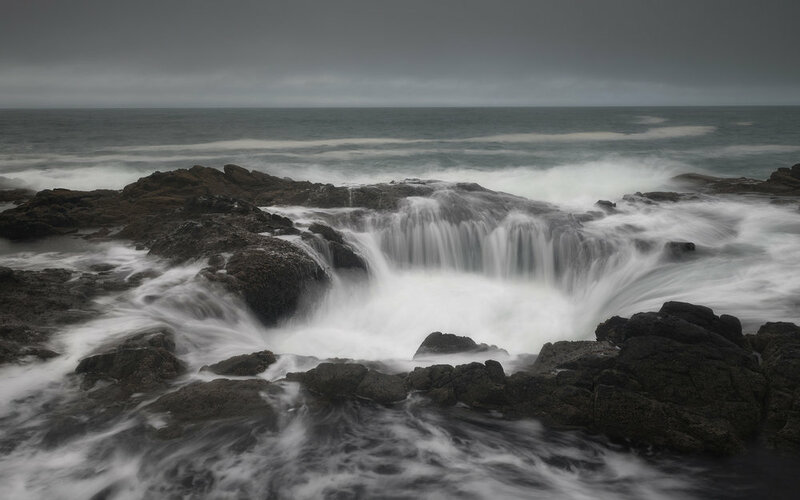 Thor's Well at high tide. Once we realized we wouldn't get the same effect close to sunset, we decided to head to Yaquina Head Lighthouse. This is a beautiful piece of coastline with an old lighthouse perched near the edge of the cliffs. Yaquina Head Lighthouse during a foggy afternoon. Finally, we spent the last 2 days at Cannon Beach and the coastal rainforest of Ecola State Park. All I can say is wow. 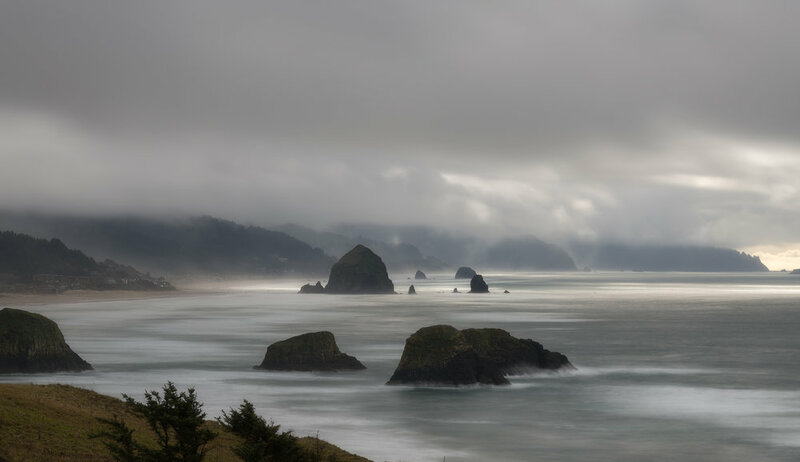 From the famous Haystack Rock, made famous by the movie, "The Goonies" to the infamous Tillamook Lighthouse, "Terrible Tilly" the northern Oregon coast is so unique. You can watch bald eagles soaring over Indian Beach in Ecola, or just relax and walk up and down the Cannon Beach Coastline. Haystack Rock on Cannon Beach. Mossy Tree in Ecola State Park. Lookout from Ecola State park facing South. Mossy trees in Ecola State park. There are so many other beautiful places to see on the Oregon Coast. I wish we could've seen them all. If you ever go during a winter storm or extra large swells, you can see some of the biggest waves crashing you have ever seen! Storm watching is big on the Oregon coast, especially in places like Shores Acres State Park in Coos Bay. Thank you so much for reading and leave a comment down below if you're planning on visiting or have any tips for future visitors to this beautiful coast! Also, I have an entire YouTube video series on my trip as well! Click the link to mychannel at the top right of the page, or if you're on a mobile device click the link to my channel in the menu tab! Enjoy!